IF a person decides that they are going to forego work, class, a nap, or what have you to join a protest against a candidate or political party, shouldn't they be required to know and understand what that party or candidate represents? More importantly, shouldn't they be able to speak intelligently regarding the party or candidate they're supporting? This type of exasperating comportment brings about substantial doubt in the voting public." Interesting question...I would say there's no easy answer. If you want to TLDR version, it simple: No to both questions. However, if you want to understand how I come to that, feel free to read on. On one level--the pretext of the American idea is that--a person doesn't have to know anything in order to do whatever one wants to do--that's a part of our "freedom". You are just as free to be peeved as someone else is to be protesting. We all do things often based on little knowledge, incorrect knowledge, or without actual understanding of what our actions say or result in...and that is really the cornerstone of our nation. As Ralph Waldo Emerson says, "A foolish consistency is the hobgoblin of little minds, adored by little statesmen and philosophers and divines...Speak what you think now in hard words, and to-morrow speak what to-morrow thinks in hard words again, though it contradict every thing you said to-day." It is an intentional quality built into the system. If we all would only be able to act when we have achieved knowledge & understanding of things, we'd so very rarely act. Additionally, we need only look at the First Amendment to see that there is no stipulation for intelligence. "the right of the people peaceably to assemble, and to petition the government for a redress of grievances." There have been limitations on this amendment such as requiring permits and such, but the knowledge isn't one of them. I'm assuming you're meaning "morally required" but if not, I guess I would ask who gets to be the gatekeeper. If "morally required"--I refer back to Emerson above but also raise the question of whose moral systems are we talking about? Should we be concerned that none of us attain the moral perfection we espouse to and should that be taken into account for whose morals we using to deem something morally required? That is, should the moral failure of a protestor be held as anything more or less than the moral failings of the person judging? "Know and understand" to what degree? The thresholds you provide are insubstantial in that they create no standard upon which all could actually agree. Knowledge & understanding--according to whom? To what degree? If a person can speak eloquently about 3 policy issues on a candidate they support or are protesting, but can't on 10 others, is that an acceptable threshold? What if those other 10 issues don't matter to the person? And how do we assess what the protester/supporter knows? Do we rely on media soundbites that purposely create and manipulate content to illustrate how smart/inept the people are? Do we administer a quiz to each person to determine their knowledge and understanding? Should we make them write essays or speeches to explain? This sounds pedantic and silly (and obviously clearly written by someone who thinks a lot about teaching & learning)...but my point is, who gets to make that judgment call about whether a person knows or understands who they are supporting or protesting? We can all easily play the game of judging others based upon a few pieces of information we know about them and the assumptions we derive from that about the person and use that to decide if someone "knows and understands"--but to me, that's a weak approach that usually only allows one to reinforce their own biases without doing the work of listening and learning what that person knows or understands and how they come to that. After all, if someone has forgone other activities to attend a protest or a rally, it means something meaningful has moved them--but meaningful to that person isn't necessarily going to be meaningful to us. To add another level of chaos and confusion to this is that each party & every candidate puts out thousands of bits of information daily--none of which any one of us can responsibly know and still maintain a functional life. This was why things like "literacy tests" were abolished as part of voting because they were often clearly used to prevent populations from voting. Whoever was deciding the threshold could easily move the field posts however they wanted. We can all play "gotcha politics" with one another based upon what we don't know about our candidates. "To know and understand what that party and candidate represents"
That's a problematic consideration as well because it assumes each party has a singular meaning and they don't. There are too many parts to a political party to be seen as singular in a way in which could be agreed up. 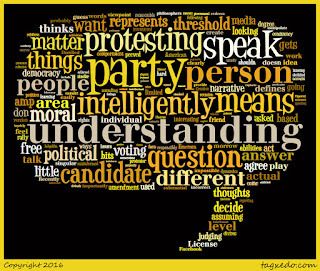 Therefore, if people can't even agree on what a party represents (or the dynamics between what the party says and what the party does), defining what a party represents is an impossible act because people who are protesting are likely to have a particular collection of facts in the form of narrative while those attending in support, may have different (or similar) facts but a different narrative that sees the party in a positive light. 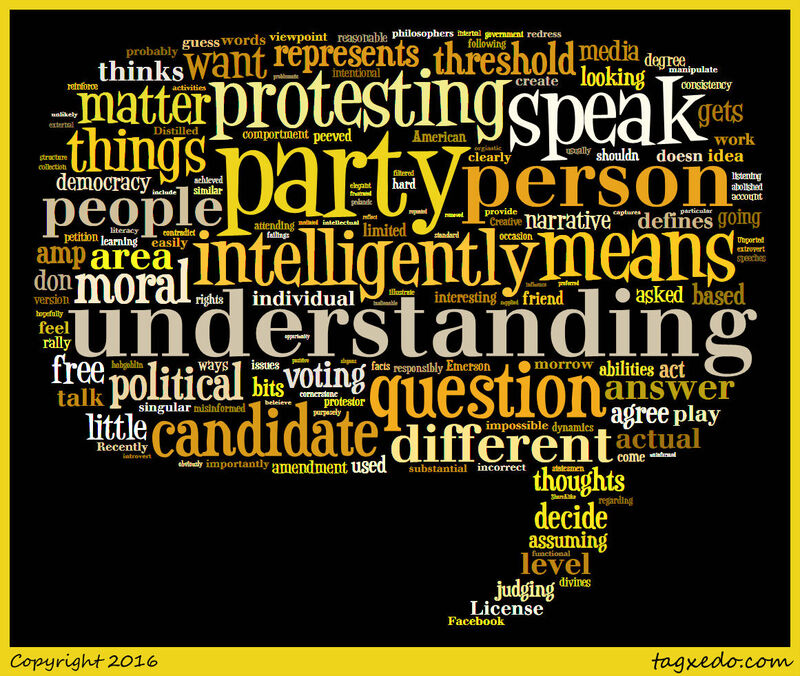 In essence, it's impossible for us to "know and understand" a party or a candidate. Besides being so far removed from said party or candidate, we are all operate with bits of similar and different information that is filtered through our preferred media outlets and into our own understanding of the narrative of politics. And of course, you have people within the party that can't agree on what it means or represents--so if the internal members can't, the external are also unlikely to do so. All of which means that your threshold for the knowledge and understanding of a protestor for a candidate you have sided with is likely to be profoundly different than what I beleieve should be the threshold or what someone else might be. As to the second question, I would further add, what does "speak intelligently" mean? Who gets to decide that threshold? "Speak intelligently" is in the same hazy space as "to know and understand." What defines "speaking intelligently"? Who defines what level of intelligence? Should it matter if the person is intelligent in area X but not area Y or area Z? Should it matter if the person doesn't care about area Y or area Z? Does it only mean "speak" and should the actual speaking abilities of the individual matter? Should it matter if they are an introvert or extrovert? Should the context matter? How someone might "speak" at a rally for their candidate may not be elegant or intelligent--given that most events are just orgiastic love-fests of repeated slogans, cliches, and "we're #1" speak, people's intellectual abilities are often not at their peak. Where we talk has much influence on how we talk, which means what the camera captures is mediated even before the media play with it. I'm assuming you mean more than speaking, but that only exasperates the dynamics upon what we judge their abilities. All of this is to say that embedded in American ideal is the individual. The individual has inalienable rights that include protesting and voting. Does this bode badly for democracy? I would say it has been a feature of democracy in the US since the start--misinformed or uninformed people has always been voting. If I were to improve the structure of democracy--that's probably not where I'd be looking to change or fix things or be frustrated by. Even myself, I know, as much as I try to be politically aware, I miss a lot and am misinformed in many ways. Probably not the response you were looking for, but hopefully not a total waste of your time ;) I appreciated the question and the opportunity to reflect on it. What about you, dear reader? What are your thoughts on the question posed or the answer supplied?